How callout extensions will get you better conversion rates and how Opteo will help you add them in a few clicks. How will callout extensions improve my ads' performance? Like the other types of ad extension, callouts improve performance via click-through rate and Ad Rank, giving you an opportunity to stand out with specific messaging. More specifically, callout extensions draw attention to unique or popular selling points or important product details and benefits. If you decide to add callout extensions, you must use at least two and can add a maximum of four. In AdWords, callouts are managed in the Ads & Extensions tab. You can add callouts at the account, campaign or ad group level, allowing you to make your callouts as general or specific as you'd like. 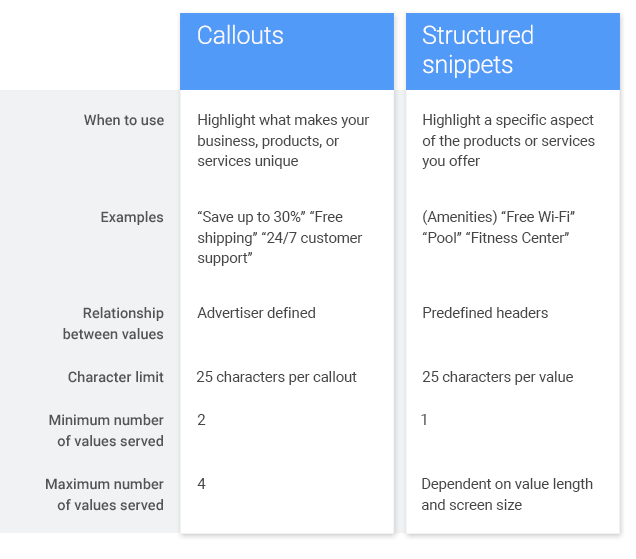 Google also offers customised callouts optimised for mobile, and options to exclude devices. How will Opteo help you manage your callout extensions? You'll see this improvement if we've detected ads missing callout extensions. Clicking Enter Callout Extensions will let you create, edit and push your new callouts right from the app. You'll also see suggestions based on your top-performing keywords and a list of campaigns missing callouts. We'll add new callouts at the account level, so all new campaigns and ad groups benefit by default.